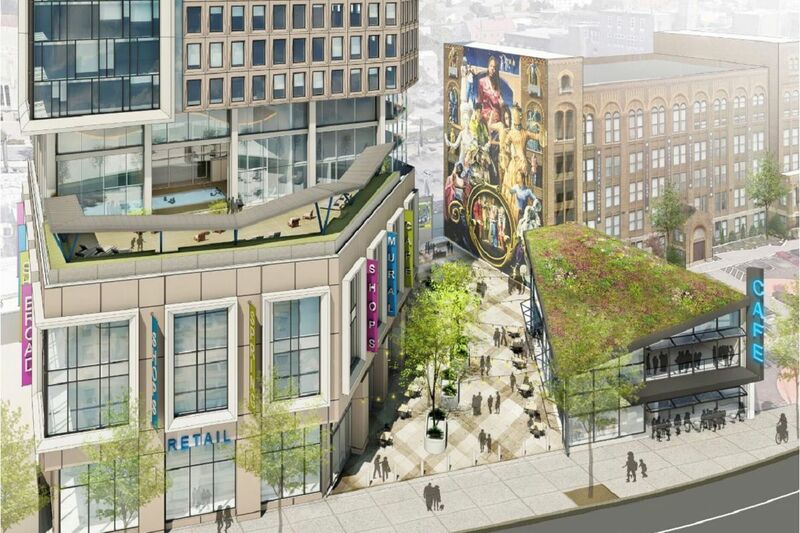 Artist's rendering of lower levels of planned Mural West tower at Broad and Spring Garden Streets. Developer Eric Blumenfeld is aiming to break ground in July on a 30-story North Broad Street tower with offices, apartments and a fitness club that he hopes to cap with digital screens featuring animated versions of the famous mural next door. Blumenfeld said Wednesday that he was close to finalizing a deal with investors in the $160 million project who will be taking advantage of the Broad and Spring Garden Street site’s location in an “opportunity zone” under the 2017 tax bill. Under that law, investors in projects within opportunity zones can claim savings on taxes from the sale of assets that have gained in value. Blumenfeld declined to share details about the opportunity zone backing of what he’s calling Mural West before the deal is signed. The tower, on the northeast corner, would rise beside Blumenfeld’s Mural Lofts apartments, formerly the Thaddeus Stevens School, which is known for the Common Threads mural painted on its side. It would be Philadelphia’s tallest building outside the city’s central core, as well as the latest — and largest — project in the city to be funded under the opportunity-zone program, which is meant to encourage development in low-income communities. Artist's rendering of planned Mural West tower at Broad and Spring Garden Streets. The project is slated to include about 205 apartments and 68,000 square feet of office space, according to a brochure prepared by brokerage Precision Realty Group to market the proposal’s ground-floor retail spaces. Blumenfeld said he’s also nearing a deal with the operator of a planned fitness center in the building that would occupy nearly 48,000 square feet over six floors. The fitness complex may include features such as coworking offices and guest rooms for overnight visitor stays, Blumenfeld said. Similar combinations of amenities can be found at Life Time Fitness Inc.'s location in Ardmore’s Suburban Square shopping complex and the planned Fitler Club private membership club being built in Aramark Corp.'s headquarters building at 2400 Market St.
Blumenfeld’s plans for Mural West also call for the tower to be crowned with digital screens playing animated vignettes based on the Common Threads mural. Blumenfeld’s other projects in the area include the recently completed Metropolitan Opera House concert venue and the Divine Lorraine apartments. Along central Philadelphia’s South Street commercial strip, meanwhile, Blumenfeld is seeking to stave off the foreclosure of the commercial and rental units he owns in the property known as Abbotts Square.